Briggs Cunningham's interest in cars was varied, to say the least, but they almost always raced in America's racing colors of blue and white. Here, in The Quail Cunningham display we see Bruce Meyer's 1960 Corvette. This was one of three entered by Cunningham in that year's Le Mans. One of them finished 8th and won its class. That was the highest placing by a Corvette at Le Mans until 2001. Mark Gessler's Fiat-Abarth 1000 won a World Championship event for under 1000cc cars at Sebring in 1962 when entered by Cunningham. 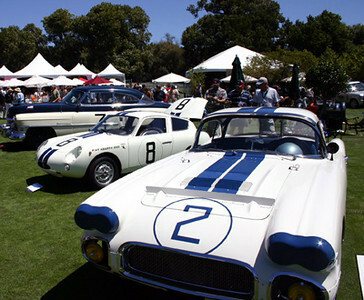 The Cadillac coupe in the background was another Cunningham Le Mans entry in 1950, where it was driven by Sam and Miles Collier. It is owned today by the Collier Collection. Credit: Michael T. Lynch. Source: http://www.velocetoday.com/lifestyle/lifestyle_120.php.